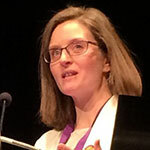 Clare Enston is NHS England’s Head of Insight and Feedback. Working alongside NHS Improvement, the Care Quality Commission and the Department of Health and Social Care, she leads on ensuring the views and experiences of patients and staff England are captured in order to drive improvements in patient experience and outcomes. Clare’s team also explore new areas of insight not supported by the current national survey programme, along with developing thinking on insight and feedback approaches in the healthcare system. Prior to joining NHS England in 2013, Clare worked in both the customer service and civil service sectors before moving into the work of NHS service improvement – latterly at Yorkshire & Humber Strategic Health Authority, where she had a regional role in health informatics.